Love the sweater, amazing pictures! Great outfit! Red, black and white look amazing on you! Love the short sweater with the longer button up. Love this holida look! Red and leopard is my favorite combo. Hope you have a wonderful trip home! love the layering...white shirt and cropped red sweater....pretty much perfect!!!!!!!!!!!!! Love the Holiday theme...definitely wouldn't work for an ugly sweater party! Love your style. Such a great look! Love the great sweater combined with the rest of the look! Such a great color on you! Love those rockstuds! What fab look, love the crop top! Great color combo! Love the cropped sweater paired with the uniform shirt. Great outfit - I love those valentino heels! Amazing outfit and those heels are HOT! Thanks for sharing and Happy Sunday! so envious of your trip back to Shanghai! 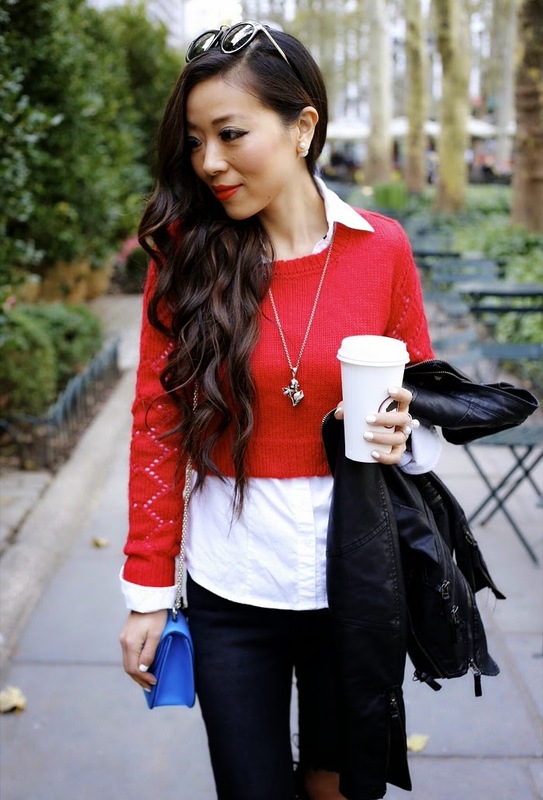 I wish I could visit my hometown Shanghai and Hong Kong for the holidays too... loving your festive red looks! Nice outfit! Love those shoes! Beautiful look! Loving the red! You look great in red babe!